Little Giant VCL Series is ideal for collecting, detecting and the automatic removal of condensate from air conditioning equipment, de-humidifiers, high efficiency furnaces, condensing boilers and other equipment where an automatic drain pump is required. The EC-1 Series is a new concept for mini pumps incorporating an improved noise reducing design and reliable solid-state switching technology. Easy to install brackets provide a quick and precise method to accurately position and secure both parts of the pump quickly. The two piece design allows the reservoir to be placed within the air handler while the pump-controller is located outside the air handler. The two components are connected via a convenient communications wire and suction tubing. EC-1 is designed for use in removing condensate from wall mount, ductless mini-split air conditioners up to 34,000 Btu. It can also be used to remove condensate from fan coils and suspended ceiling air conditioners. The pump can be installed above the air conditioner in a false ceiling, behind the wall mount air handler, or in plastic conduit or line-set channel. 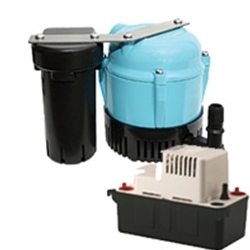 The reservoir, featuring a clear tank, connects to the condensate drain hose and must be positioned flat and horizontal while the pump can be oriented in any position within 3.3 ft.
EC-1-DV model is designed to accommodate multiple electrical requirements within one pump. The DV suffix indicates that the pump is capable of operating from a wide range of supply voltages to maintain consistent pump performance. Similar to our EC-1 model, this model includes improved noise reduction, reliable solid-state switching technology, and easy to install mounting brackets to create a pump that benefits contractors, installers, and end-users. EC-1K Line Set Duct provides space to install the EC-1, line-set pipes, electrical wiring and drain hoses providing a clean, finished look in any décor. The pump is easily accessible for maintenance or cleaning by removing the cover (no tools required). When using the EC-1K Line Set Duct, the EC-1 pump is always properly positioned to maximize the quiet operation of the pump and keep the reservoir level for ideal operating performance. EC-1K is a special version of the unique EC-1 mini condensate pump that includes Line Set covers for mounting the pump on the interior wall, next to the indoor ductless mini split air conditioner. The product can be easily and quickly installed on either the right- or left-side of the air conditioner. The Line Set cover provides dedicated positions for mounting the pump and reservoir in secure and easy to service locations. Room is provided inside the duct for the Line Set and electrical wiring. Generous room is provided in the lower “elbow” portion of the duct to easily bend and fit the Line Set pipes. The design isolates the EC-1 pump to maintain its low noise performance specification. The EC-1K-DV model is designed to accommodate multiple electrical requirements within one pump. The DV suffix indicates that the pump is capable of operating from a wide range of supply voltages to maintain consistent pump performance. Similar to our EC-1 model, this model includes improved noise reduction, reliable solid-state switching technology, and easy to install mounting brackets to create a pump that benefits contractors, installers, and end-users.